Nell & The Hot Mess Muggers: Nell & The Hot Mess Muggers return to Green Note after the recently sold-out launch of their debut album, Sous le Ciel de Paris. 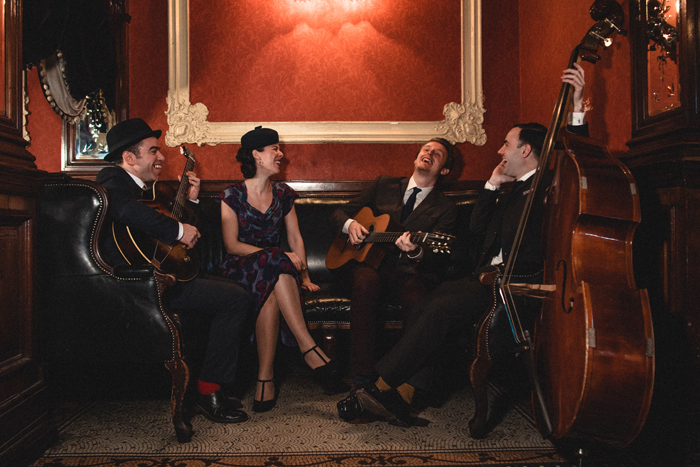 Lead by Nell Greco and beloved by Francophiles across London, this chanson-enamoured ensemble has created a distinctive sound that draws on the influences of gypsy-jazz masters and swoon-worthy swing legends. Their repertoire is carefully chosen to celebrate a golden age of French and American music, with a hefty dose of personal expression that draws from more contemporary sounds, too. For this very special Valentine’s Day event, Nell and her affectionately called ‘Muggers’ will be joined by Mike Guy on accordion. Come enjoy the music, and you might find yourself taking a little joie de vivre home with you.